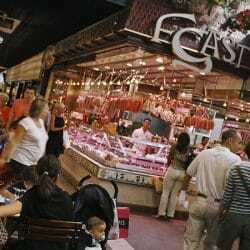 La Croix Rousse Market – One of Lyon’s biggest and liveliest outdoor food markets. Every day except Monday in La Croix Rousse, there are around 100 local vendors selling a huge variety of fresh fruit, vegetables, meat, fish, poultry, cheese and bread as well as hot dishes sold ready to eat. The food market of La Croix Rousse lines the Boulevard de la Croix Rousse which is a part of Lyon’s UNESCO world heritage site. One of the busiest markets in Lyon, Le Marché de la Croix Rousse is one of the best places in Lyon to do your grocery shopping. Almost 1km in length it has vendors selling a huge variety of delicious things to eat. 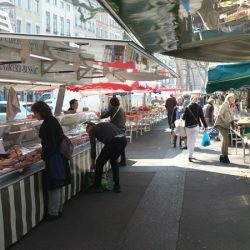 La Croix Rousse is the ancient working class neighbourhood of Lyon and the emphasis in this market is on local producers and the majority of the vendors live in the area. 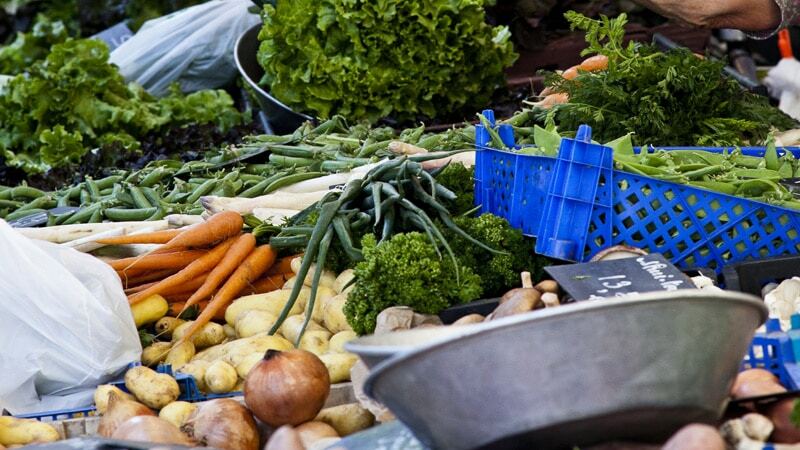 There is always a good selection of organic produce available in additional to traditional producers and every Saturday morning the first couple of hundred metres of the market are devoted exclusively to organic food. There are also many vendors selling tasty prepared foods such as spit-roasted organic chickens, huge steaming platters of paella and huge piles of sauerkraut and sausages. Every Tuesday taking place on the other side of Le Boulevard de La Croix Rousse is the “non-food” market. It’s a tremendous selection of fabrics, footwear, clothing, household items, tools, luggage, and just about anything you might need for the house or home. Parking is limited in the area but if you must come by car then use the underground parking located at 73 Rue de Belfort. The best way to get to the market is to use the metro line C which takes you from Hotel de Ville directly to La Croix Rousse. The market begins almost directly at the entrance to the metro station. Alternatively take bus C13 from Hotel de Ville. It’s a great way to spend a morning in Lyon and do your grocery shopping. There is a terrific selection of locally grown produce as well as imported spices, flowers and cooked dishes ready to eat. After taking a tour of the market sit down at one of the many cafes across the street and enjoy something from the fresh seafood vendors who are there on weekends. The market is open everyday except Monday from 6am to 1:30 pm. (closes at 1pm Wednesday and Thursday) It can be a fun place for children but since it is often quite busy, especially on weekends pushchairs and strollers are not advised.